The patent pending Ultra 180 mounting arm is the only arm with full 180° of vertical rotation and offers full articulation of your monitor and keyboard. This unique arm provides 180° of horizontal rotation at the wall mount and up to 360° of swivel at the joint between the Ultra 180 arm and the Ultra A1 extension arm. The keyboard tray provides positive, negative and neutral tilt for ergonomic comfort. It has a slide out mouse tray on both sides and a built-in wrist rest. The Ultra 180 stows close to the wall, making it the perfect choice for tight spaces. The arm is available as a wall mount, wall track mount, pole mount or desk mount options. and nine custom colors to match your decor. The Ultra 180 arm mounts in a narrow footprint of just 3″ and stows tightly against the wall. The mounting arm rotates up to 360 degrees horizontally and has horizontal and vertical reach of 16” (40.6 cm), so you can place your computer exactly where you need it. To extend the reach, an Ultra A1 arm can be added to the configuration as shown above. The Ultra 180 computer mounting arm supports up to 32 lbs (14.5 kg) and can be custom configured to meet your needs. 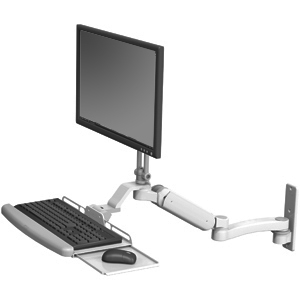 The Ultra 180 Arm enables an LCD and keyboard to be suspended on a 3” wide wall mount, pulled out when required, and stowed out of the way when not in use. The Ultra 180 Arm is machined out of billet aluminum for strength and durability. The Ultra 180 Arm provides up to 16″ (40.6 cm) of vertical adjustment.